One of the things I'd always really wanted when I eventually had a sewing room of my own, was a quilt design wall. You might remember this photo below from several months ago. After a few days of messing around with the colours and then packing it away again so that the room could be used for other things (like sleeping and getting dressed in the morning! ), it somehow never got sewn together as it all felt too much effort. A design wall would have been perfect and made it all so much easier. 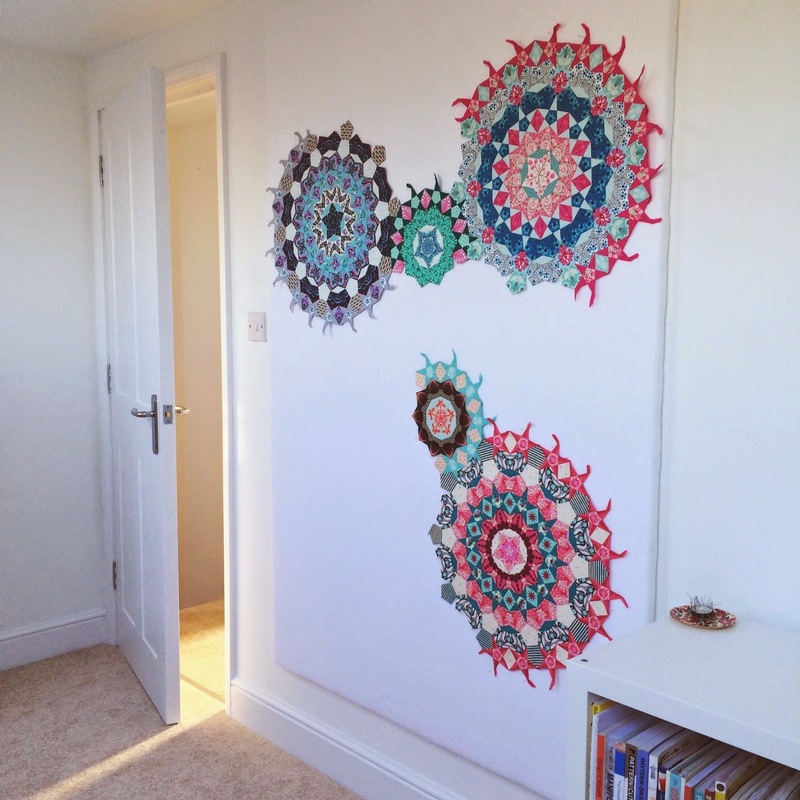 However, I'm now unsure why I felt I needed to have a sewing room to have a quilt design wall - when I finished making one yesterday and stuck it to the wall, I realised that it would have looked absolutely fine anywhere else in the house as it just blends in with the wall when it's not covered in fabric. Anyway, not being in possession of that knowledge, when I moved into my new sewing room this week, one of the first things that I did was gather supplies to belatedly make a quilt design wall. If you haven't heard of one of these, it's basically a large homemade 'wall' covered in either flannel or quilt batting, on which fabrics can be placed to enable playing around with the design of a quilt before sewing it together - the magic of it is that you can place fabrics on the wall without the need for pins as flannel or quilt batting naturally 'grab onto' the fabric and hold it in place. If you use polystyrene as a basis for the design wall, it also means you can pin into it, which is what I've done with the paper pieced cogs at the top of this post, which still all have their papers in place, so wouldn't stick to the wall. I bought my polystyrene in small pieces from Hobbycraft as this was the only way I could find of buying it in England. On the upside, this meant I could make the wall exactly the size I wanted. The polystyrene is about 1"x12"x16" (that's a rough guess, as I didn't measure it before covering it) and cost around £4 a board as it was on offer as it's being discontinued. I stuck it all tightly together with some white gaffer tape. 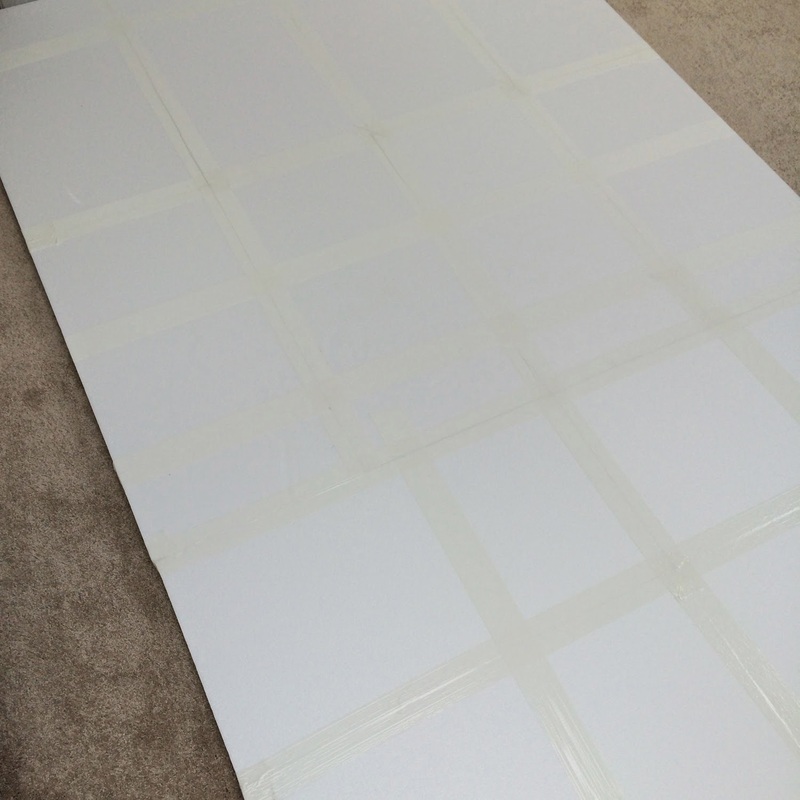 I then covered my polystyrene in two layers of quilt batting, stapling it tightly in place on the wrong side. Then, for the final layer, I used a brand new white flannelette flat bed sheet from John Lewis. I taped this layer in place with the white gaffer tape as I didn't want staples to scratch the wall. The wall, being made mainly from polystyrene is incredibly light, so I just used Command Picture Hanging Strips to hold it to the wall - I placed about twelve of them on there, and I'm happy to report that the board is still in place this morning. The nice thing about these is that apparently they don't damage the wall if you want to remove them later. This wall is so soft and snugly that it actually makes you want to cuddle it. Actually, I have to admit that after my husband and I had put it up, we did take it in turns to stand flattened against the wall with our arms outstretched, faces turned to the side, enjoying how incredibly soft the flannel was, especially when placed over a pillow of quilt batting. 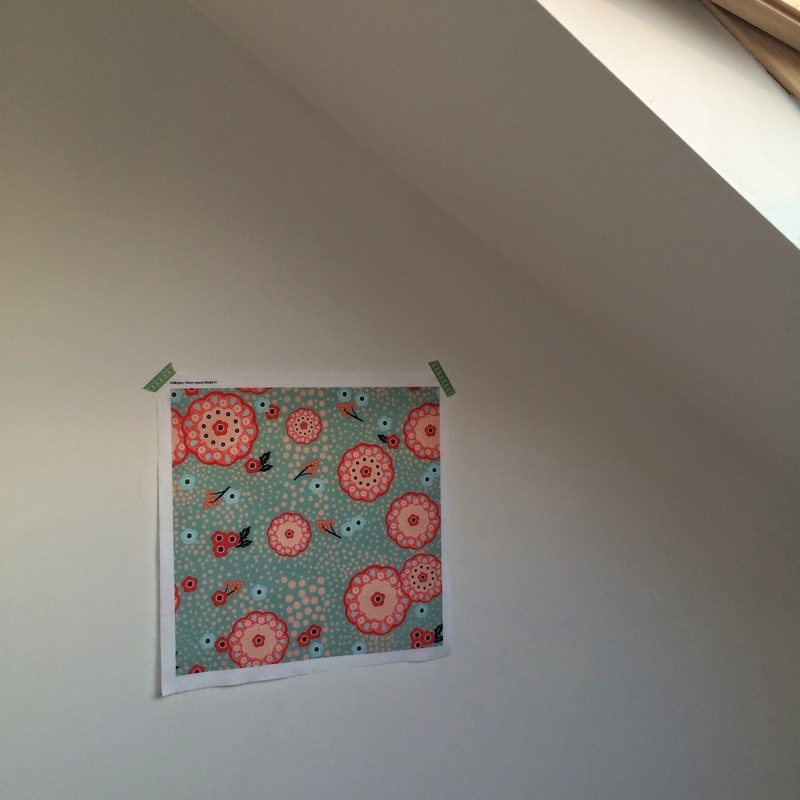 Wall hugs are a completely unanticipated benefit of a quilt design wall. The rest of the room is slowly coming together…I'm still waiting for a few bits of furniture to arrive and it's taking an inordinately long time for me to decide where to hang my thread racks and put pictures up and other inconsequential, but enjoyable, preoccupations like that…but it's getting there and it's pinch-myself-lovely to have a room where I can now store all my things. Once we'd moved all of the sewing paraphernalia up to the third floor, I walked back into our bedroom and had a complete realisation moment of: so this is what normal people's bedrooms look like! No sewing machine, no thread reels hung on the wall, no work-in-progress pieces on the desk. From nearly a decade ago, when sewing was more of an occasional thing for me, I have a memory of how lovely our bedroom at our old house always felt - it just looked so tidy was such an oasis of calm, which I realised I've really missed in sharing our room with all my sewing. And as well as calm, we also have storage! For clothes! And under the bed I can now store shoes instead of fabrics. It all feels quite incredible. I'm also enjoying having a room just across the hall from my daughter's new bedroom - I'd never wanted to feel detached from the rest of the house if I had my own sewing room and it's actually felt incredibly cosy to be up here together. 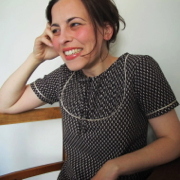 Over the weekend I read a blog post by Abby Glassenberg that talked about an issue that had lodged in my head, but which I'd been too confrontation-averse to previously mention anywhere publicly, other than to discuss it with my husband. I had kept wondering though: are other people as shocked by this as I am…but no one had said anything, so I'd assumed it was just me being fussy and kept my feelings to myself. 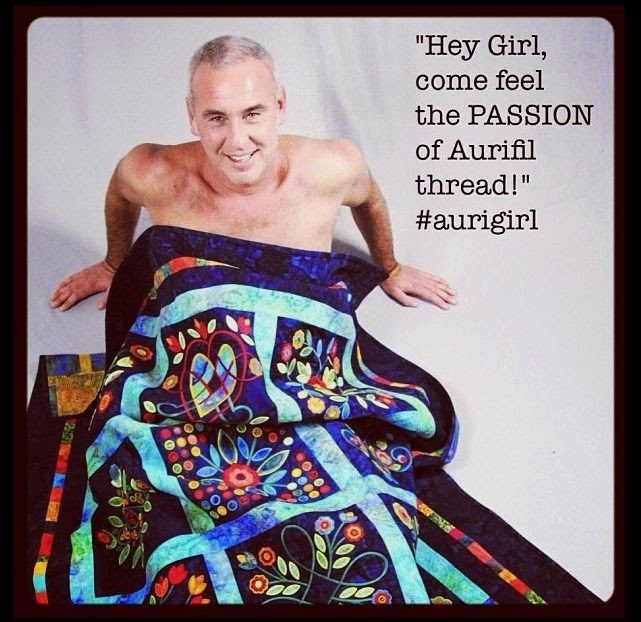 To give you some background to the brand in question, unless you follow some high-profile designers, you may not be aware of how the popularity of Aurifil has arisen, but Aurifil has quickly gathered a cult status, after being used by dozens of high profile quilters and designers (their piecing work and quilts hashtagged with Aurifil), which quickly trickled down to it becoming widely stocked by independent quilt shops worldwide. To me, this rise of Aurifil is largely attributable to one man - Aurifil's frontman, Alex Veronelli. For those not familiar with his online presence, Alex is charismatic, likable, charming and mildly flirtatious in an inoffensive way. 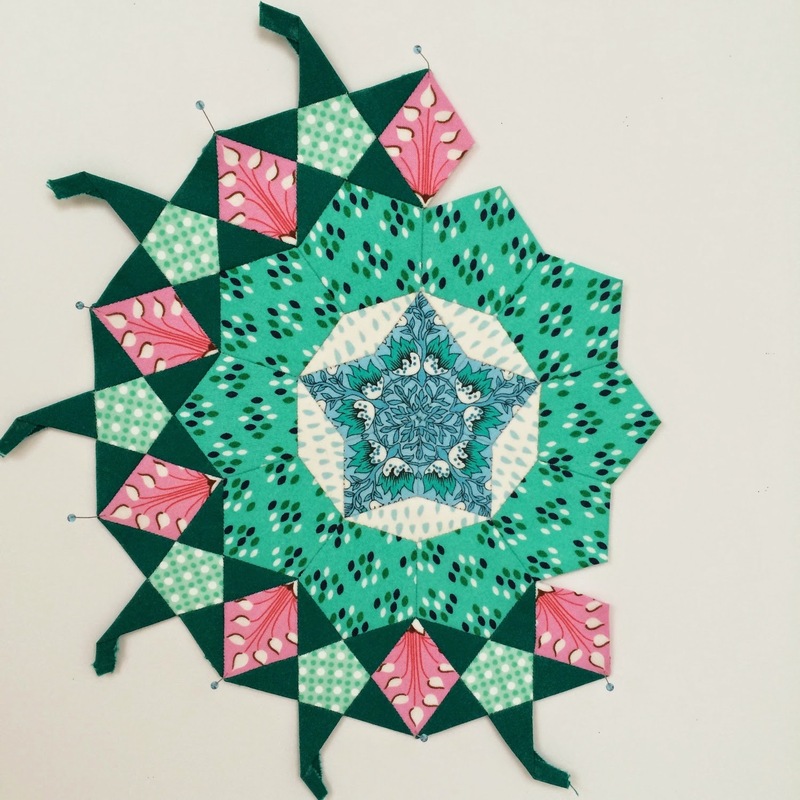 In the predominantly female quilting community, his presence has seemed to seal the deal of making Aurifil's Italian thread a highly covetable item. I don't have a problem with this at all - we are all susceptible to presentation - I'd be the first to admit that when I buy something, I'm often buying into the whole lifestyle of what that product has been packaged to convey (my husband and I laughed over this when we realised we'd bought some dog treats for £5, largely because they had been placed in a small, recycled cardboard box, stickered with an attractive label and postured as organic and wholesome. Lucky Nell! I'm not sure whether she actually appreciated the difference though). Before I detail what I've found troubling about Aurifil's recent marketing campaign, I feel I should preface this by saying that I've met Alex once in person, albeit very briefly, and he seemed to actually be very reserved and this is borne out by what others have said about him too - all who've come into contact with him seem to say that he's respectful, professional and also been hugely supportive of their work. 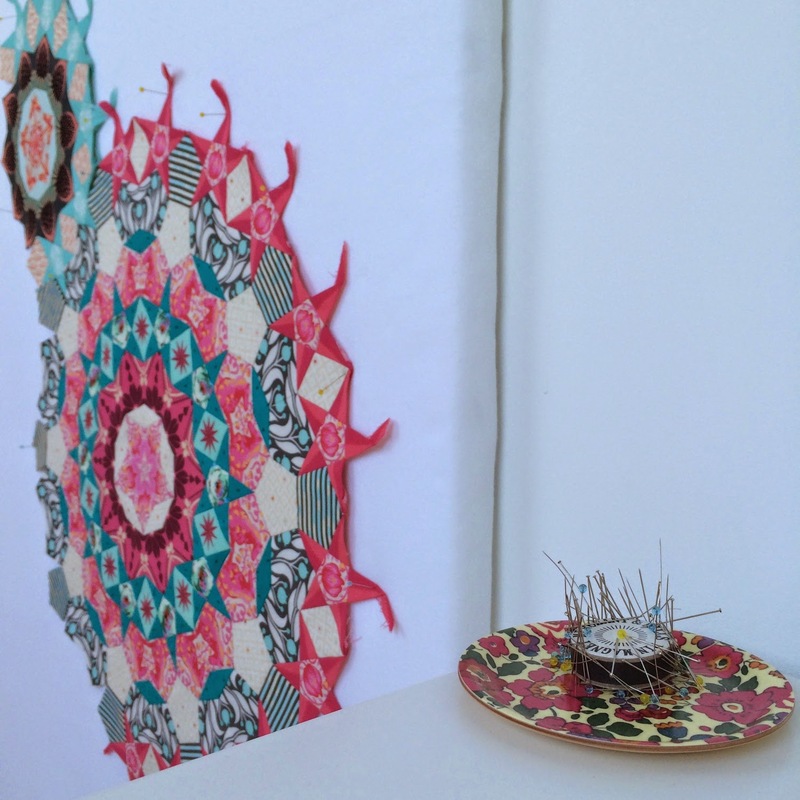 However, a few weeks ago, during the time that Quilt Market was being held in America (a trade only event where designers and manufacturers unveil their new lines to the industry media and shop owners), photos began popping up on the feed of Aurifil's PR woman, showing an ever-growing series of different high-profile women from within the quilting industry sitting on Alex Veronelli's lap, hashtagged with #aurigirl, collected over the course of a few days. After several photos in this vein, I unfollowed the woman who was posting them, as the whole thing felt a bit, for want of a better word, vomit-inducing. I couldn't quite understand what this particular marketing campaign was trying to say to me as a potential Aurifil user…other than that if I used Aurifil threads I could become defined by them and hashtag myself as an #aurigirl and aspire to sit on the knee of Alex Veronelli too… I like the threads and he seems like a very nice man, but as a grown-up woman living in 2014, neither of those things speak to me on a level that feels in line with how I wanted to be marketed to. In the interests of giving a rounded view - there was one #auriboy and one fantastic photo of Angela Walters, where she'd clearly refused the request and said that he could sit on her knee instead if he wanted. Alex is sitting grinning, while Angela's arms are placed firmly behind her chair, rather than wrapped around him. Apparently all of these women were happy to take part and most look really quite happy and in the comments to Abby's post, some have said that they still feel completely happy with it. However, for me it's not really about that at all - it's more about what Aurifil are trying to say as a company and what their message is. I don't think there's anything wrong with a woman sitting on Alex Veronelli's knee at all if she's happy to do so…it's more how it looks when seen on mass with the hashtag #aurigirl applied to it - it begins to feel slightly misogynistic and like a collection of 'calendar girl' shots. Aurifil's other curious marketing campaign is a take on the Ryan Gosling caption pictures that went viral last year. If you don't remember these, people honed in on how generally lovely the actor Ryan Gosling seems to be and began posting pictures of him looking generally cuddly and helpful with lines like: Hey Girl, you carry on sewing, while I make the dinner tonight. 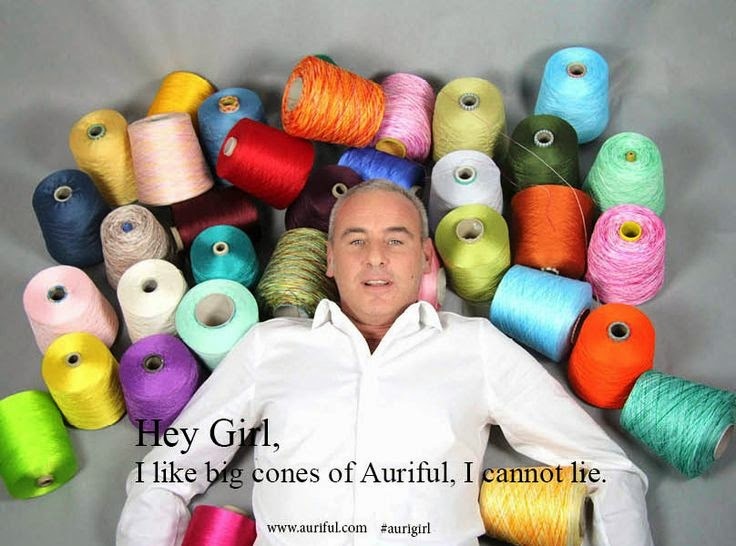 Aurifil's take on this has been to post pictures of Alex Veronelli lying (apparently) naked beneath a quilt; lying over a sea of thread cones; or erm, a photo taken from beneath Alex, showing him standing astride something with the camera clearly focusing on his crotch, and asking fans to write captions for the photos. It feels like the sweetness of the Ryan Gosling idea has somehow been lost in Aurifil's translation of it and morphed into something that just feels really quite weird. I do wonder how much of this is Alex being a good sport and playing along with the ideas that the Aurifil PR department are coming up with for him. Or, when surrounded by a sea of adoring women, whether he's lost sight of what he actually wants to be doing and is just trying to people-please and live up to the Italian stallion reputation that's previously worked so well for his company. Or maybe he's actually happy with this line of marketing…who knows. Alex's Twitter presence has always been on the risqué side of things - when I first began following him on Twitter about three years ago I was bemused by the jokes that would randomly appear in his stream, until another quilter told me that she thought he consulted a joke book for these. Either way, they were fairly inoffensive and some of the ones that I saw actually made me laugh. However, I tend to use Instagram more than Twitter nowadays, and it seems the jokes now have a slightly more unpleasant feel to them. In her post, Abby sites several examples, but to give you a quick flavour, a recent joke that he posted was "Do you want to know the 'Victoria's Secret'? Their lingerie doesn't look the same on your girlfriend as it does on their models". For those who aren't aware of it, Victoria's Secret is an American lingerie chain. For anyone who remembers the overnight downfall of Gerald Ratner and his chain of jewellery shops in the 1990s, the first rule of business is not to insult your customers. With a list of predominantly female followers, is this really good PR to be posting jokes like this that are at the expense of everyday women? I generally take the approach of, if I don't like something I ignore it or stop looking at it. However, when a company's whole marketing campaign seems to be based on things that have misogynistic overtones it feels bigger than that and it makes me feel that if no one joins Abby in saying 'hang on a moment - I'd really love you to market your threads to me in a different way' then nothing will change. I think their current marketing campaign currently makes a fool out of its customers. When I was growing up, I'd always thought that things like this really didn't matter too much. I lived with lots of men at university and never once felt offended by their banter or conversation. In my life as an adult, I'd pretty much thought feminism in England was unnecessary, as the battle for equality here had already been fought and won a long time ago - the people I surround myself with like women and don't see them as anything other than equal. However, a few months ago, I watched a documentary called Blurred Lines, presented by Kirsty Wark. It was one of the most eye-opening things I've ever watched and it completely changed my perception of why saying the smaller things like this aren't okay is really important, even in England where we don't suffer the kinds of horrendous oppression that some other cultures do. So, back to Aurifil, this isn't an attempt to vilify Alex or Aurifil. It's simply a public request for them to do things differently and make other people aware of what's going on, so that if you feel the same, you can ask for that too. In our age of social media, any mistakes that a company or person makes are painfully clear for all to see - which is quite difficult when we're all human and so do make mistakes. I really believe that it shouldn't be the (in my opinion) error of judgement that's the issue, it's how a company or person reacts to people questioning it that matters. I think that Alex is a brilliant and charismatic front-man for Aurifil, I just wish that they'd market their products to me as though I'm an intelligent consumer, rather than someone who will be swayed by photos of prominent women sitting on his knee with Alex in Father Christmas mode or invitations to catchphrase a man's crotch. This isn't a request for people to boycott Aurifil. 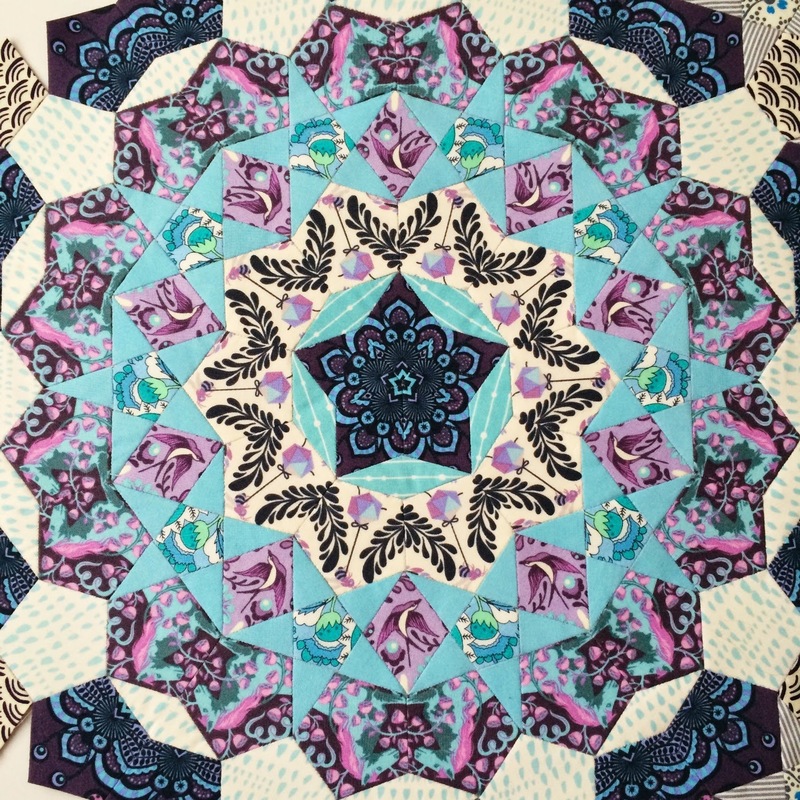 Their success has been backed up and largely facilitated by being stocked in independent quilting shops, most of which are run by independent businesswomen. If it's the thread that you'd buy anyway, by stopping buying it, quilt shop owners will be left with thread stock that they find difficult to sell. I'm imagining that they don't stock Aurifil on a sale or return basis, so that would seem a fairly awful consequence and isn't something I'd want to be implicated in. To me, the best approach seems to be to politely ask Aurifil to change their marketing tack - whether that's through writing a blog post or messaging Alex on Twitter or writing to them directly. If enough people let them know that they'd prefer to be marketed to in a more respectful way, then hopefully they'll take that on board. UPDATED: Alex responded to me via Twitter this morning with the following comment: Loved your post and its clear storytelling, you're rightly pointing out suggestions that I will make treasure of. This evening, Abby Glassenberg wrote to let me know that Aurifil have now removed the offending photos. What a fantastic result - I'm so pleased. 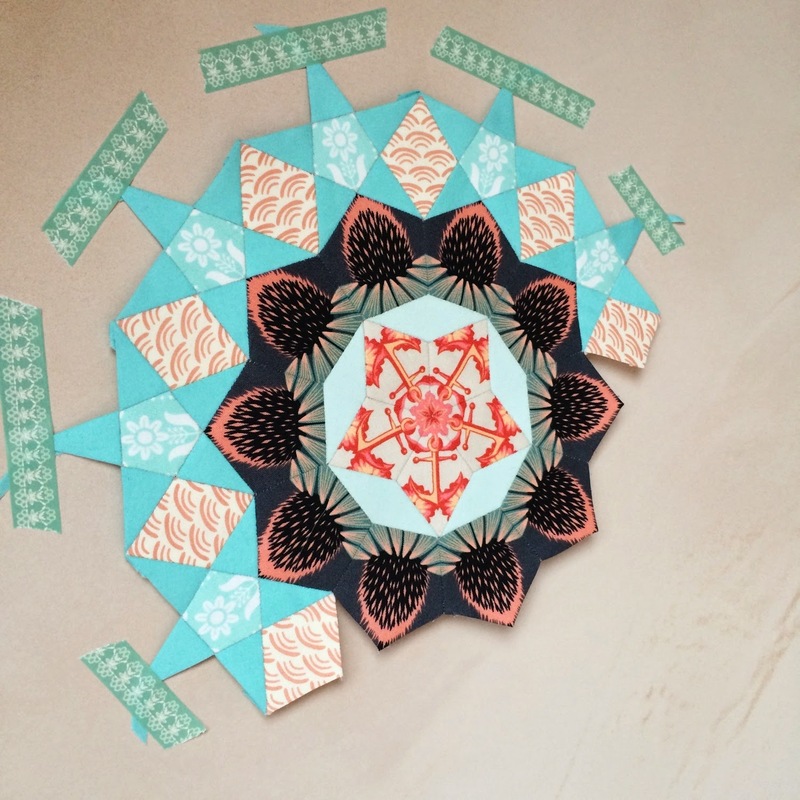 You may remember that several months ago I ventured into designing my own fabric. My printed results were really mixed and I realised that learning the computer skills involved in creating a print wasn't the only learning curve I needed to get my head around: understanding what will work when printed onto different base cloths is another thing - which is exactly why the ability to buy test swatches of your fabric designs is such a fantastic - and essential - part of the process. 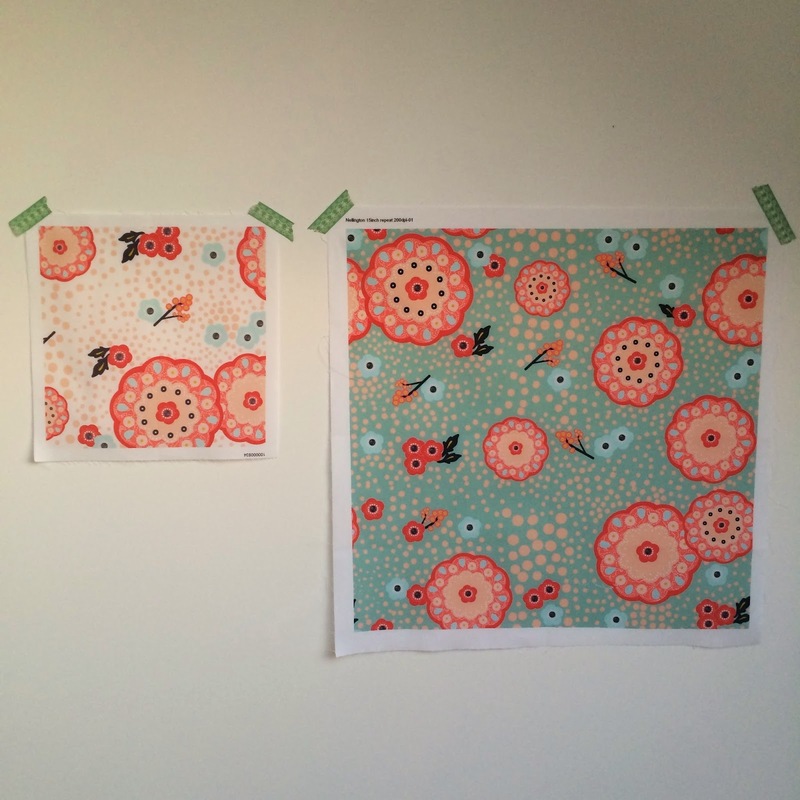 I thought I might share some of what I learnt and I also wanted to tell you about Woven Monkey's brand new cotton poplin basecloth, which they can also now print your designs onto (and which I love). I'd originally had trouble deciding on the scale that I wanted to have my prints produced at - I was torn between tiny detail and a bolder, larger size. For this reason, I created both prints at two different sizes - one where the same portion of the design repeated every 5.5" and another where it repeated every 15". This gave drastically different looks, but even more so when printed on cloth. When I analysed it afterwards I realised that something like a Tana lawn base cloth gives an incredibly smooth, fine surface for printing, which means it can also carry far more detail…however, if you were to put the same design onto a quilting cotton base cloth, some of the detail may inevitably be lost in the tiny holes created by the more open weave structure. This isn't apparent for large scale prints (below, left), but it's obvious with very small scale prints (below, right). The moral of this story is not to expect white pinprick dots to look crisp and well-defined on a very peachy pale background: they'll just make the peachy bit look slightly blurry and faded. If aspects of a design are smaller than a grain of sand, it may be worth considering it as a design more suited to paper than fabric, or scaling everything up a little. For reference, the smallest white dots on the perfectly printed fabric on the left are still just less than a millimetre in size…they're just not crazy-small like the dots that barely show in the right-hand print. 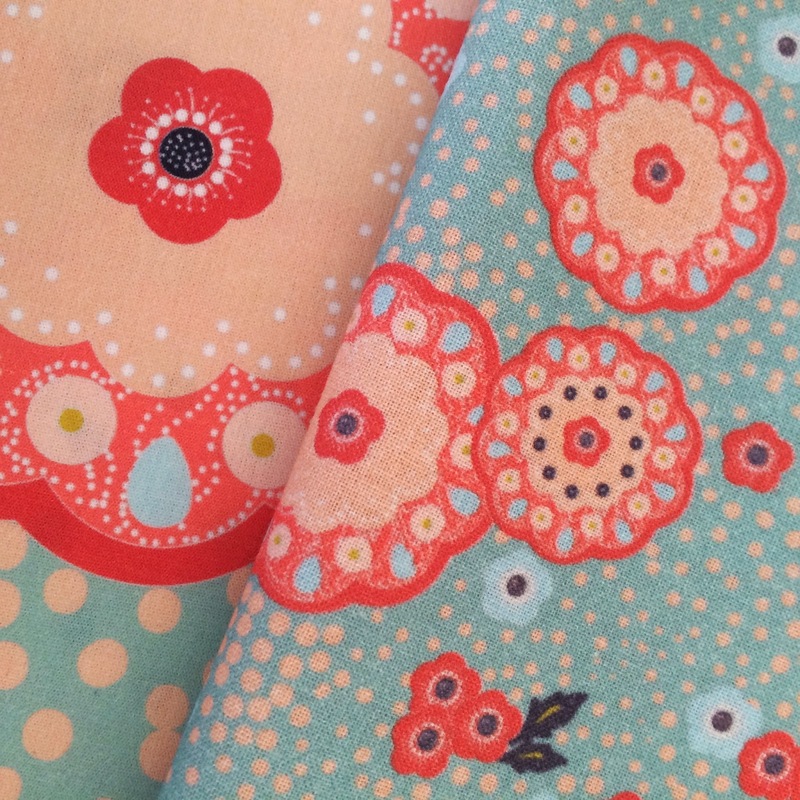 Woven Monkey has just introduced a cotton poplin to their range of base cloths for custom printing. For the uninitiated, poplin is a much smoother-surfaced, more tightly woven cotton than quilting cotton and it's the fabric that I personally associate with making children's clothing as it has a crispness that really lets it hold a crease or stand a little proud from the body (although that's a personal association, as many, including Liberty, use poplin for making men's shirts. It would also be great for skirts). If you're thinking about poplin from a quilter's point of view, its tighter weave makes it more akin in texture to the amazing cotton that Art Gallery Fabrics use as their main base cloth, but with a little extra crispness. Despite poplin's very smooth surface allowing more detail to be captured in the printing process, I've abandoned my small scale print, as with just a 5.5" repeat, the amount of concentrated detail in it just didn't translate well to fabric. 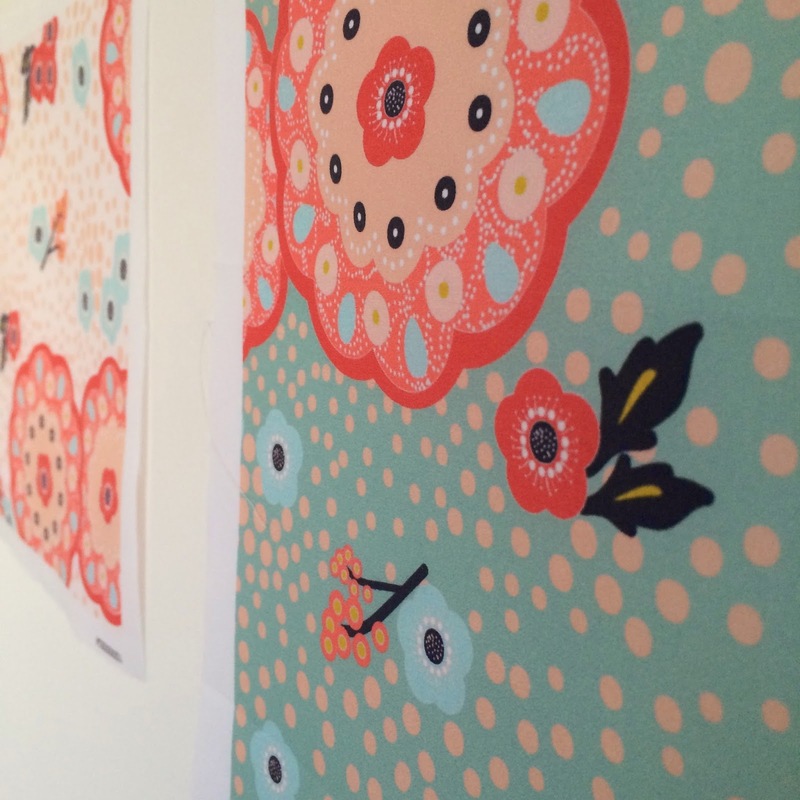 However, I'm delighted with the way my larger scale designs have printed out on to the poplin. I love my larger turquoise sample too - it's about the size of a handkerchief and I'm tempted to do a tiny rolled hem so that it's useable…although that would mean losing the name and print detail, which I felt oddly delighted by. So there's another tip: if you upload any of your own fabric designs onto the Woven Monkey site, make sure you name your file something that you really love. 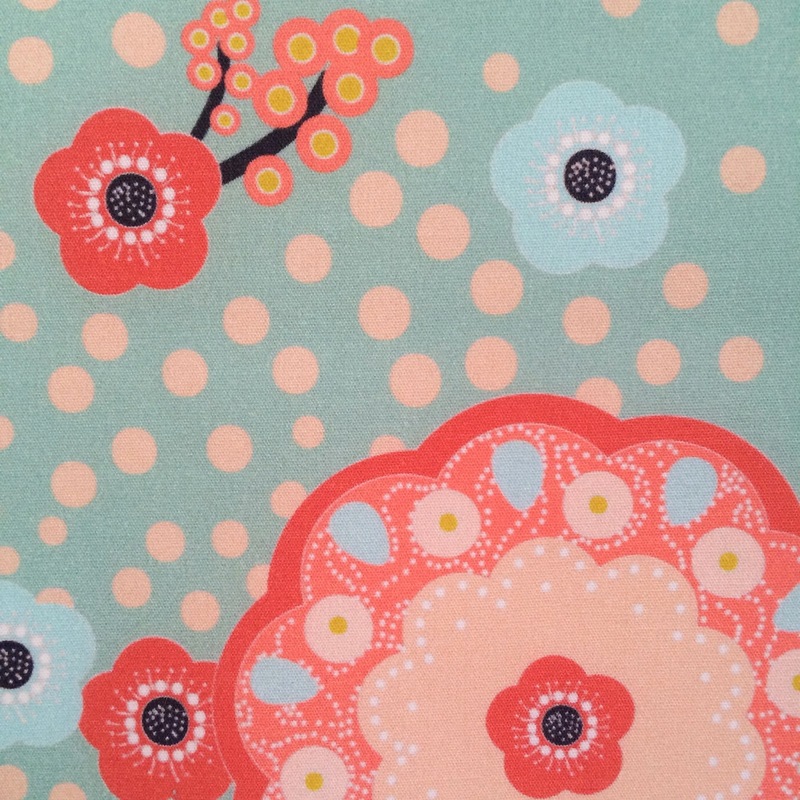 I called this fabric Nellington after our dog, Nell. Here's some close ups for you, if you're interested in getting any of your own designs printed up. I personally prefer the poplin (which is what's shown here) to the quilting cotton because it naturally shows more detail, however, it's personal preference. If you do happen to get your design printed up on quilting cotton, be prepared for the fabric to have a slightly starchy feel when it first arrives - I hadn't expected this and so found it a little disconcerting, but it's easily removed with a quick wash and I'm guessing is probably just a temporary effect of the printing processes. Last night we finally finished painting my future sewing room. So like an excitable squirrel (I'm imagining a Squirrel would immediately want to pile nuts up in any new squirrelly accommodation in order to make it feel just right, ditto myself with fabric), the moment it was done I taped my fabric up on the new walls to see how it looked. It was odd to see how instantly it made it feel like 'my' room to have some fabric in there, even though the floor was still a testament to my wild and rather exuberant painting style (as I write this it's being covered over and hidden forever with a thick layer of carpet and my daughter is distractedly reading a book, waiting for the moment when we can start moving furniture into her new room, where she will sleep for the first time tonight). Anyway, back to the fabric. You don't actually need any computer skills at all to design your own fabric - painting, drawing, photographs, typography…whatever, it's possible to create your own fabric from any of those things and the Woven Monkey website can take care of your repeats so that you get a well-spaced print. Just make sure you get a test sample printed before ordering yardage so that you can tweak things if you're not happy - Edward, who runs Woven Monkey (and who sponsors my blog! ), is incredibly helpful and very responsive to feedback, so you'll be in the safe hands of a friendly human. 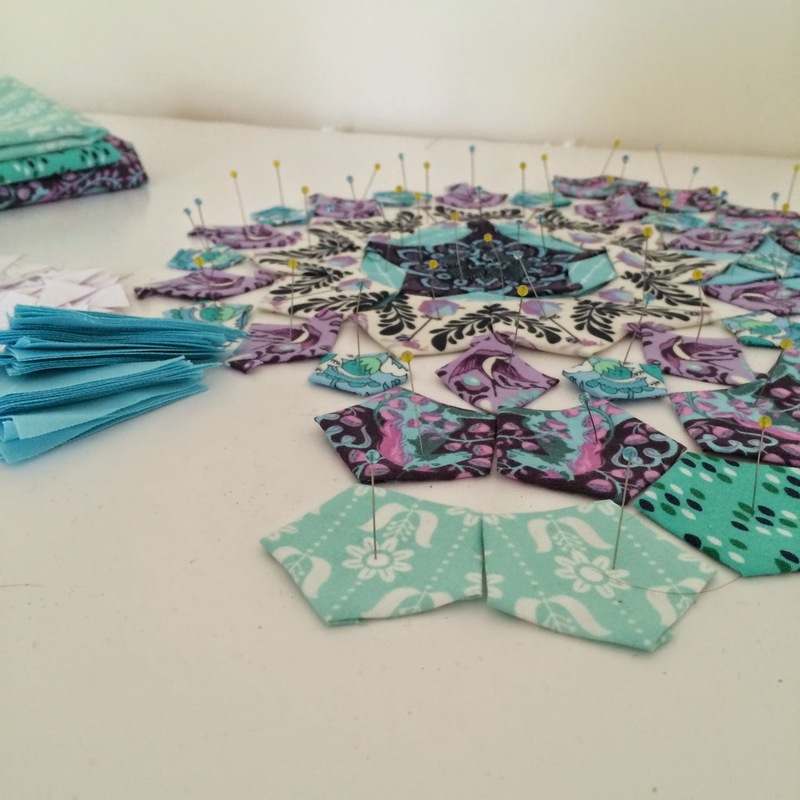 If you want any inspiration as to what other people are doing with their own fabric designs, you can see this recent blog post here. 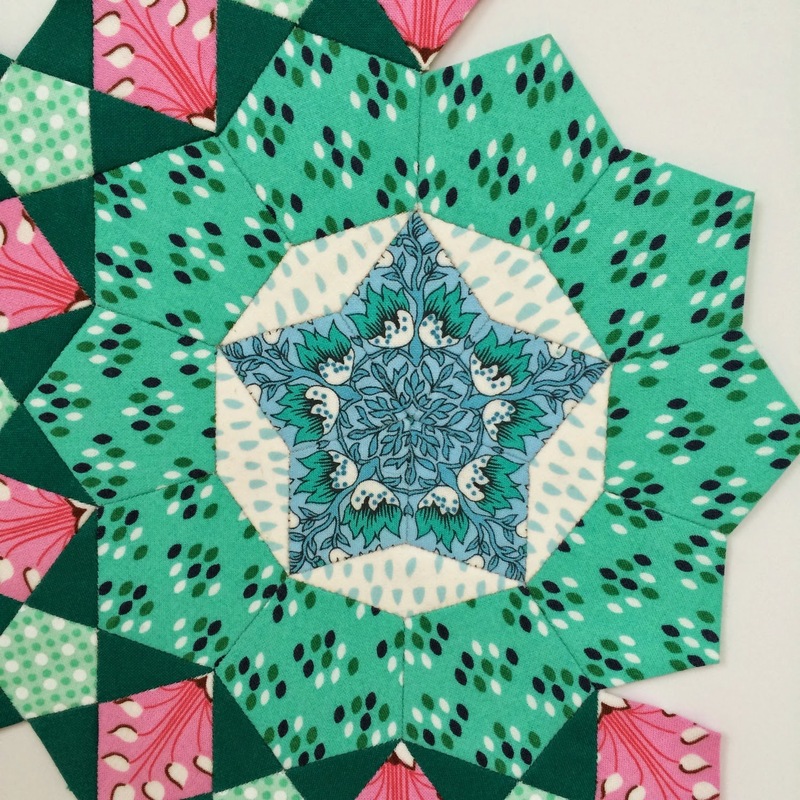 Since I've been working on my passacaglia quilt I've become obsessed with prints that have symmetry so that they can be fussy cut easily. 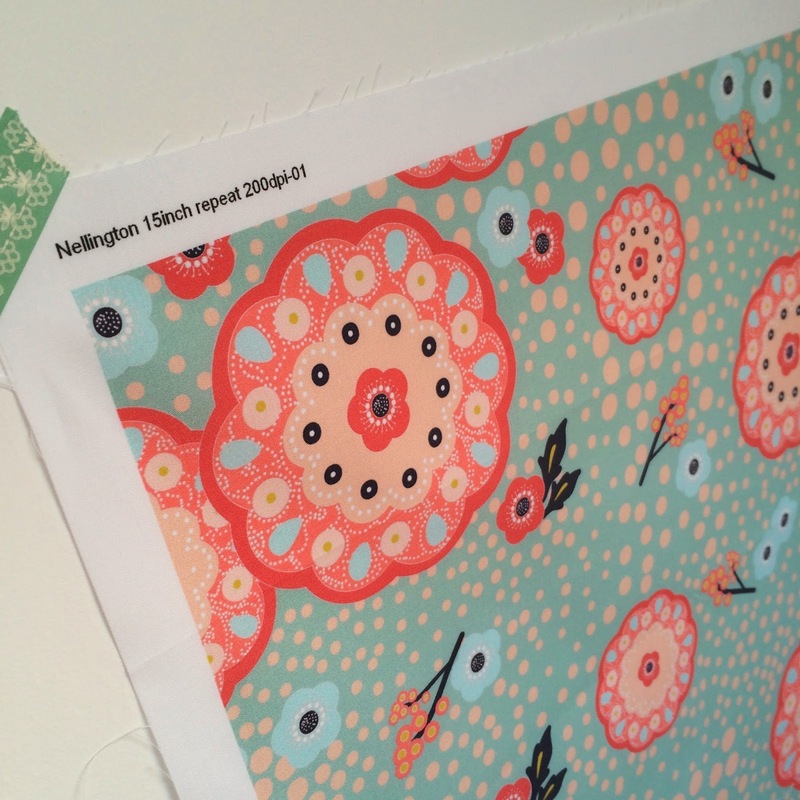 For this reason, I'm thinking about attempting a print that's less random instead of pursuing Nellington any further - I'd quite like a small bit of self-designed fabric to feature in my quilt. 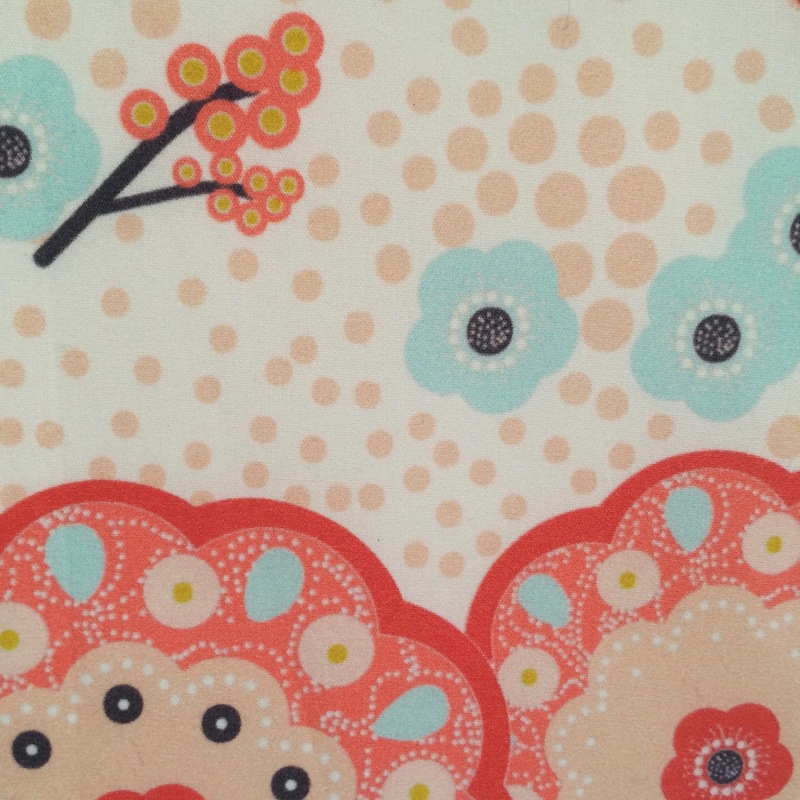 Anyway, quilters, I'd love to know - do you have any thoughts on using cotton poplin in a quilt? I think in the last few years people have been mixing substrates more - certainly a lot more linen has been making an appearance - but what do you think about poplin? If it's pre-washed I'm imagining it shrinking at a different rate from the quilting cotton wouldn't be an issue…any other thoughts? 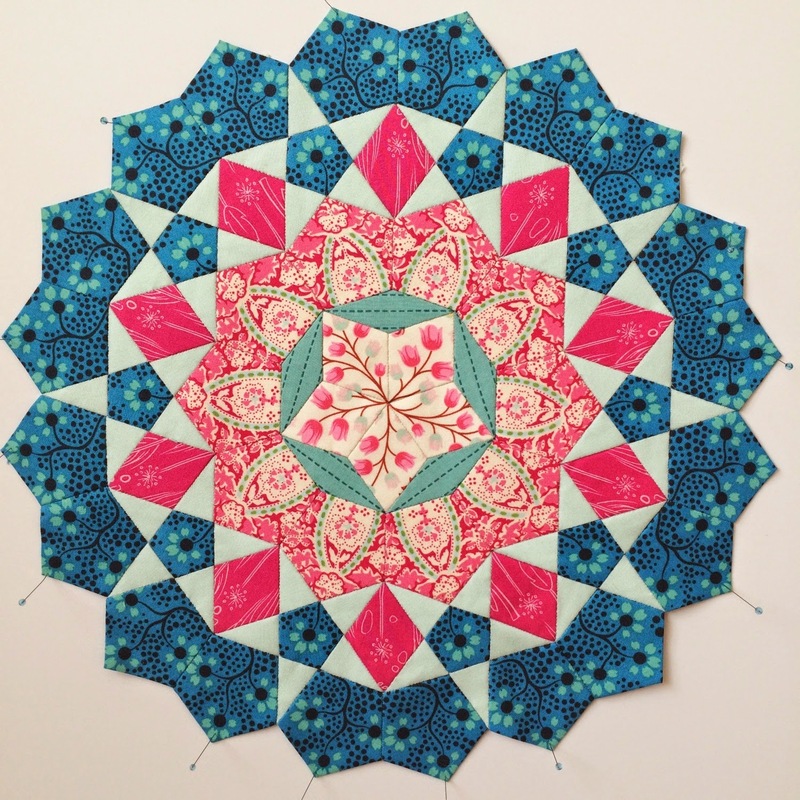 I have a few more cogs for my Passacaglia Quilt to share with you. This one is my favourite of the two as aqua and pink feel such easy colours to work with. When I make a cog with these colours I have a restful sense of being at home, in an unchallenged, slopping-about-in-my-pyjamas sort of way. Although, the dash of very dark green in the star points did feel like a brave venture to finish with. By contrast, this apricot and aqua cog felt like more of a challenge, but was perhaps entirely appropriate as it's so sympathetic to the bare plaster which I photographed it on and which was monopolising our days at the time it was being made. We've now moved on from plastering to actually getting our hands dirty ourselves! 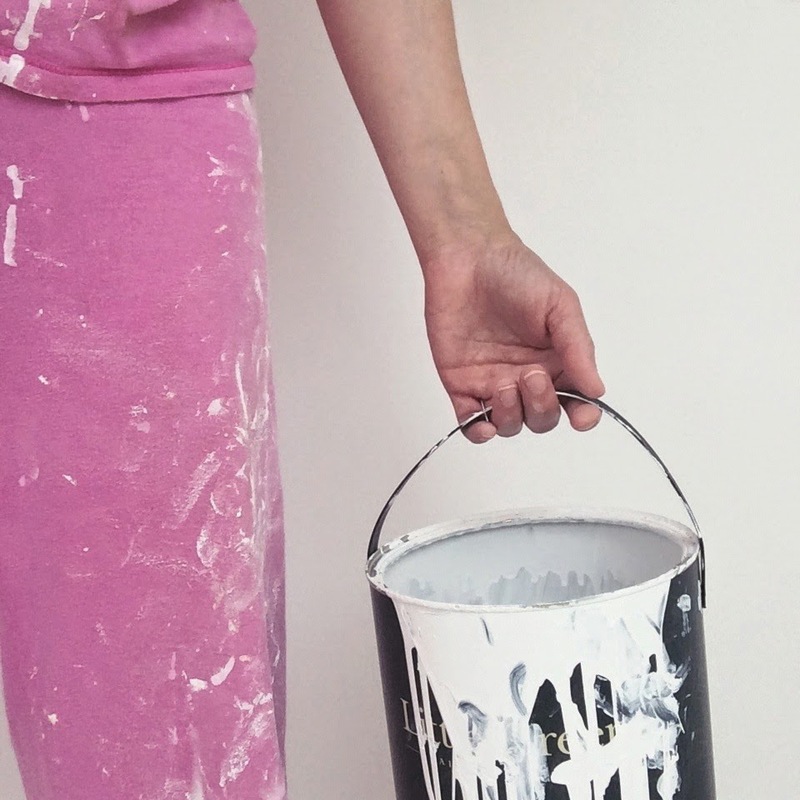 Since Friday, I've spent pretty much the entire time painting the loft and daubing myself in paint. This photo was taken at the start of day 3. I'm such a chaotic painter that the only way to try and contain the mess normally is to also don a shower cap and plastic gloves along with these old summer pyjamas…unfortunately, England's current humidity levels meant that the wish to remain unsplattered by wrapping myself in plastic was overwhelmed by the desire not to actually cook myself, even though I think if I had chosen that route it could have passed as an all-weekend Bikram yoga session, as the combination of heat and the bendiness required to paint sloping walls would almost certainly qualify - they are, unexpectedly, far worse than ceilings with a higher frequency of paint-in-eye. I have just one wall left to do before we're ready for carpeting tomorrow, shortly followed next week by the arrival of much of the Ikea catalogue. After promising myself several years ago that I would avoid Ikea in the future, I have found myself magnetised by the simple, clean-lined whiteness of it all and how incredibly affordable it is when you find yourself faced with the need to buy several items of furniture at one time. This photo was taken during the final week of work, when we had six or seven workmen from different trades in everyday - it was incredible quite how much they got done each day. I've never had building work before that didn't involve several days' wait as different trades came and went or those frustrating days where for no apparent reason suddenly no one arrives at all…but somehow the man in charge of our loft seemed to have everything planned like a well-choreographed ballet performance and less than six weeks after it was put up, our scaffolding is gone, along with the men who seem to have broken my fear of heights by imploring me to climb it. This week, I stood on a bar stool to change a light bulb - a task which normally induces vertiginous sickness and requests that the children don't ask me questions incase multi-tasking causes me to fall - and realised afterwards that I'd done it without any sense of panic at all. 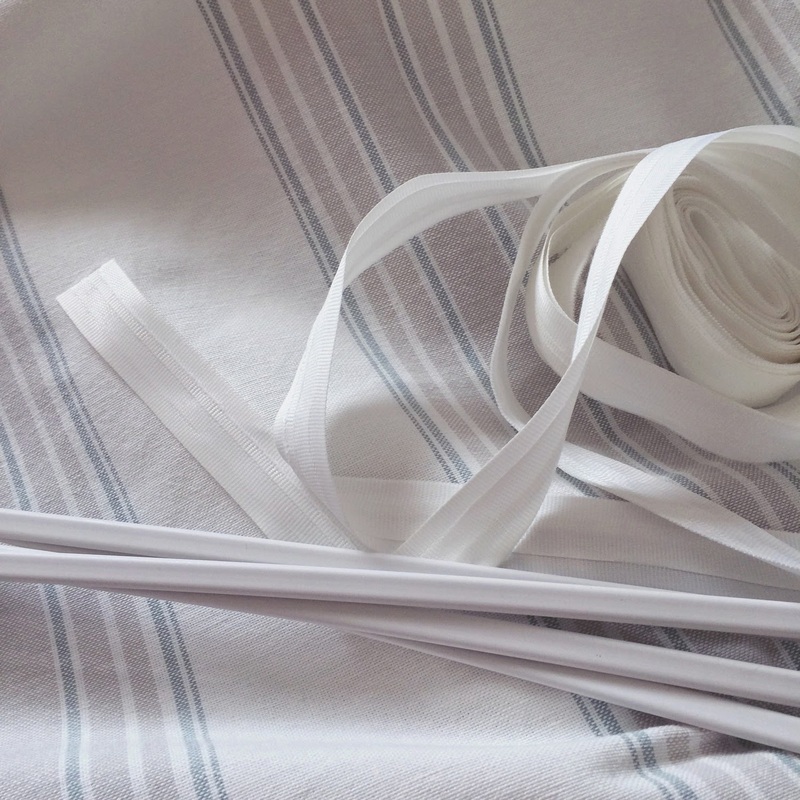 This week I will have to delay any more English paper piecing until I've made a roman blind for my daughter's new room. I really dread making any sort of window covering and it's at these times that I temporarily wish I didn't know how to sew so that I'd be able to justify outsourcing the task; I find the maths for roman blinds and getting all the folds to cascade in just the right way to be a real headache, but I'm keeping in mind what a good feeling it is to sometimes put my sewing to such practical use. I've made some before, but it feels curiously like starting afresh - my mind is a blank slate when it comes to remembering how on earth I did it. Luckily, after several hours of staring at paper, YouTube tutorials and feeling disbelief at the numbers I was churning out for the folds, I found The Roman Blind Wizard and used a free credit to let it calculate the measurements needed. There's a brilliant YouTube video which talks you through how to fill in the slightly complicated-looking form and I've decided to trust that the measurements it's come up with are right, on the basis that the woman who did the demonstration video for the calculator had a kind, reassuring voice and spoke as though it would definitely work. I'll report back on whether this was good rationale. 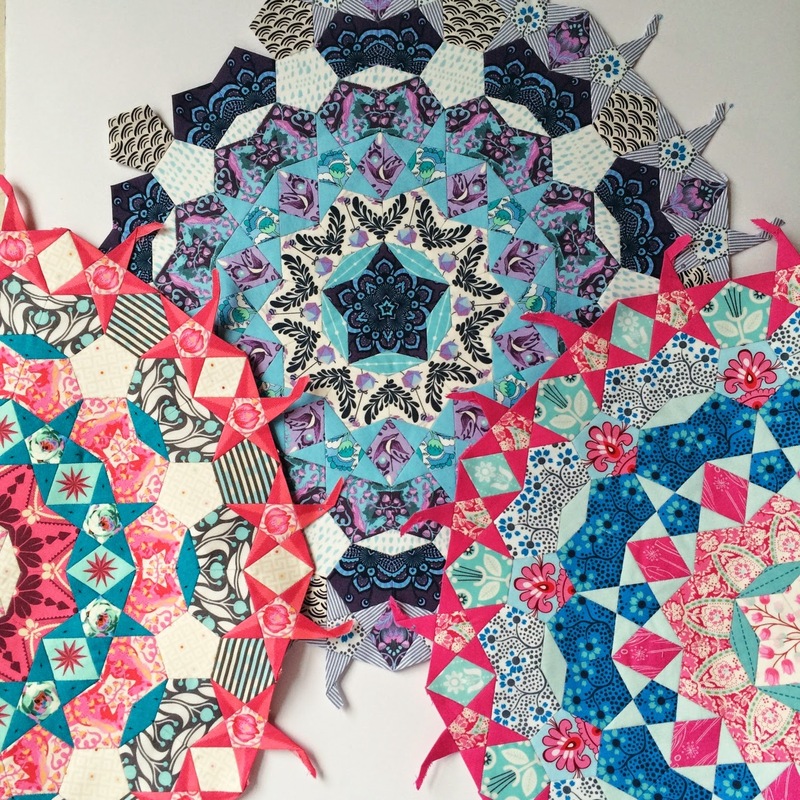 Despite the blog silence over such matters, I've been beavering away on the cogwheels for my Passacaglia Quilt in the evenings, finding that fun can be had in purple horses' heads as well as pink! The purple cog was a real challenge for me - it's not a colour that I'm naturally drawn to. Someone said to me that you should try to do one thing each day that scares you: so I've been working with purple and climbing up to the top of scaffolding for our loft conversion, even though I found the colour initially difficult and even though I have the kind of fear of heights where I feel so convinced I'm going to fall that I want to just jump off to get the inevitable over and done with. Reader, I actually like the purple cogwheel and I've been up and down the scaffolding several times and am not writing this from a hospital bed. I'd call that success all round, although I don't feel scaring myself in these ways is truly necessary every day. I think this fresh aqua and pink cog is my favourite so far. I find the intensity of the midnight blue fabric completely thrilling. Here it is when it was still a work in progress. 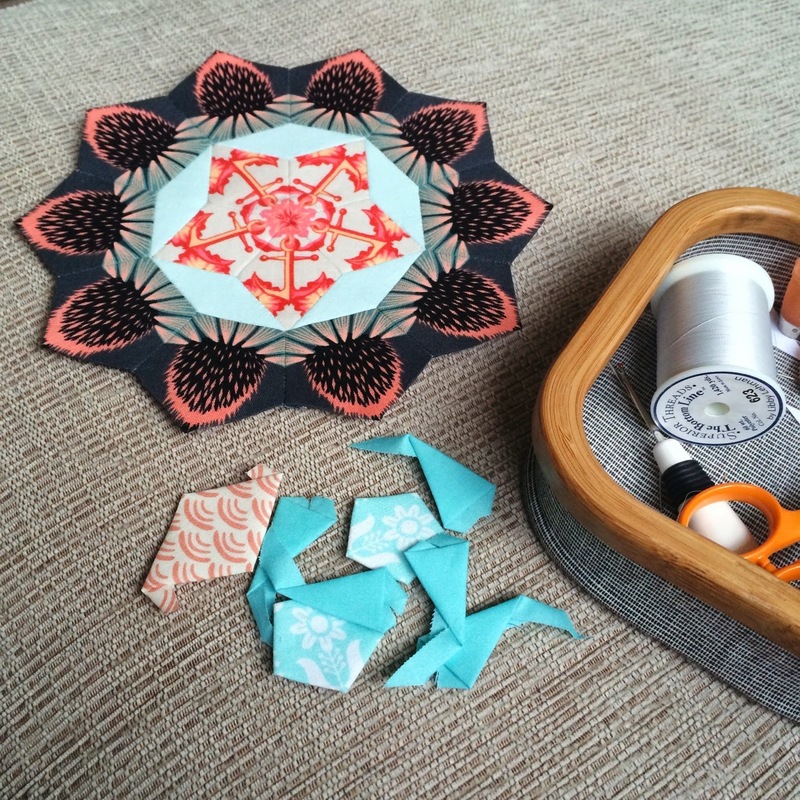 I'm now starting work on a grey, coral and aqua cogwheel. I feel slightly nervous about this one as my daughter really doesn't like the colours and I usually find that she has a knack of being right about things when it comes to colour. I'm persevering for now on the basis of scaring yourself apparently being good for you (was it you that said that, Kerry? )…but I'm willing to let it go if it turns out not to be quite right and just reap the terror benefits instead. What I really do love about it though is that the Anna Maria Horner print looks like the the swimming hats of synchronised swimmers when cut like this - it's actually echinacea. 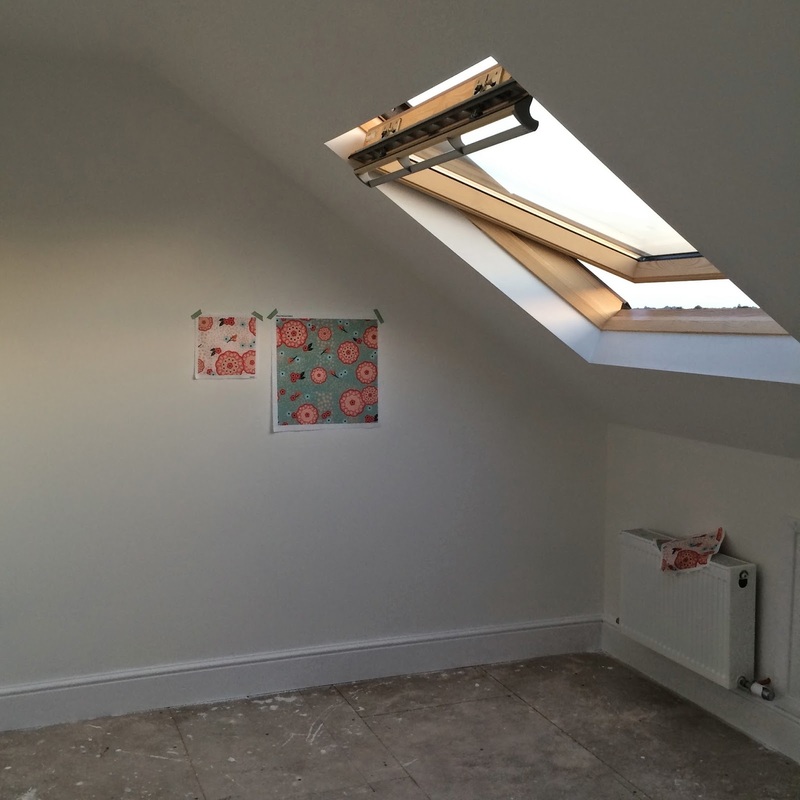 Because my daughter and I have a slightly guilty habit of absolutely LOVING studying the house renovation details of others, I'm going to assume that others might too and share some of our own loft progress, also known in my own head as 'Dreams can come true as part of this is a sewing room' and possibly in my daughter's head known as 'Dreams can come true as my new room will actually have space for a full-size single bed!' (the latter, while true, reminds me of Monty Python's wonderful Four Yorkshiremen sketch - if somehow you've missed this - although I've never knowingly met anyone in England, at least, who has - please do watch it as it's utterly brilliant. And I defy anyone not to adopt a simple Yorkshire-accented 'Luxury!' as part of their lexicon after seeing it. One word that can convey so much). Anyway, back to our loft. It's all slightly curious as, while I've no idea how long the finishing-off aspects will take, so far everything has been far faster than my wildest expectations allowed me to hope for. 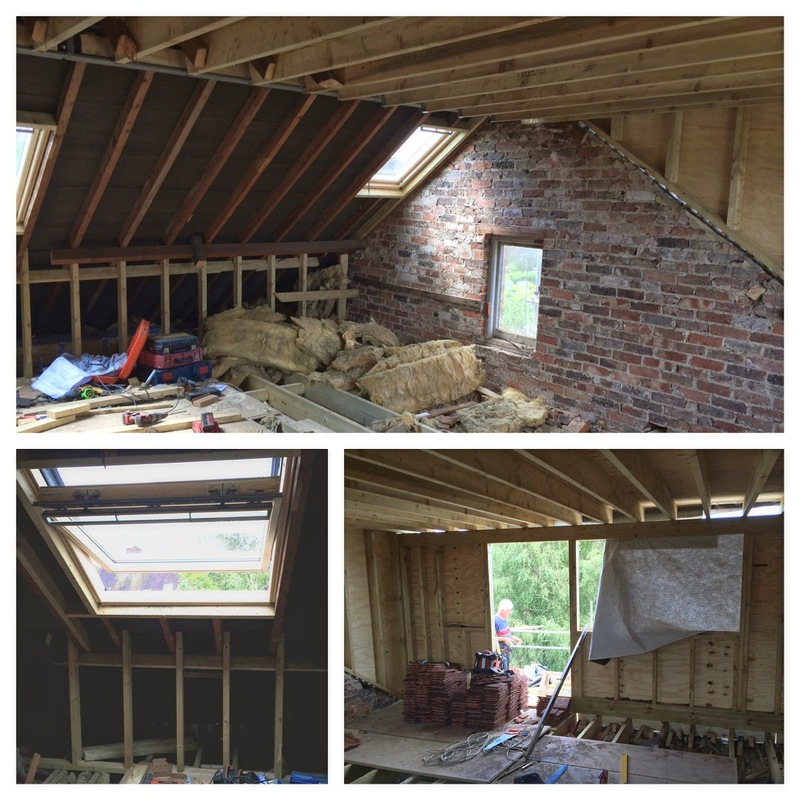 In less than three weeks the dormer window was built, the building was watertight again, all the windows went in and a staircase was finally installed last week, which means that I can stop going up and down the scaffolding entirely. This week it's all being plastered, and at the weekend I'll actually be painting walls. 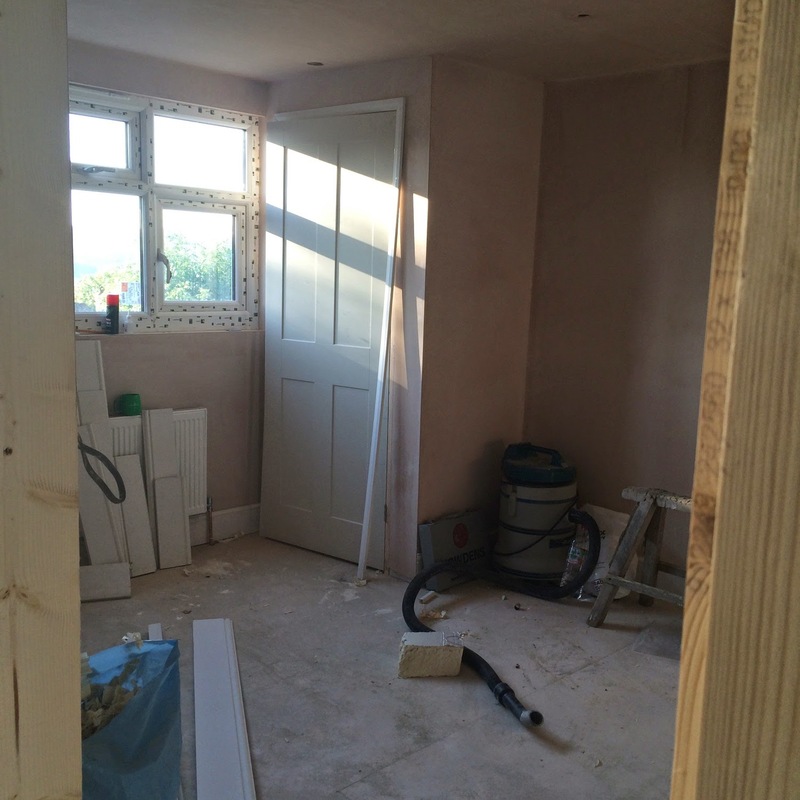 Next week will be about bathrooms, radiators, lights and plug sockets and possibly having some doors hung. The staircase going in feels like a real landmark, as even though in reality there's a lot to do still, in my head it feels like it's nearly finished. The photos below are from several days ago now. The side with the sloping roof will be home to my sewing room, while the flat roof side will be my daughter's room. On the night the staircase was installed, we took a snackish dinner up there and sat and ate it surrounded by power tools and piles of plasterboard, just because we could (as scaling scaffolding really only lends itself to stashing the odd toffee in your pocket and is less conducive to transporting a feast of houmous and crudité). The smallest cat is equally excited and has been sighted on several occasions testing the stairs out for stability and frequently wearing a veil of dust as a mark of her adventuring. I am convinced that she has been smiling, which is unprecedented in one who normally wears a small, anxious face at all times. My son has even taken to doing his homework sitting on the unfinished stairs because it's apparently more peaceful than the rest of the house. In non-loft-related news, my lovely friend, Lisa (also known as 'the bag lady'), has recently brought out some children's sewing patterns. You can find them here. They are EXACTLY the type of thing that I would have wanted to dress my own daughter in when she was younger - I'd be tempted to try and wedge her little legs into them now if she wasn't already taller than me. 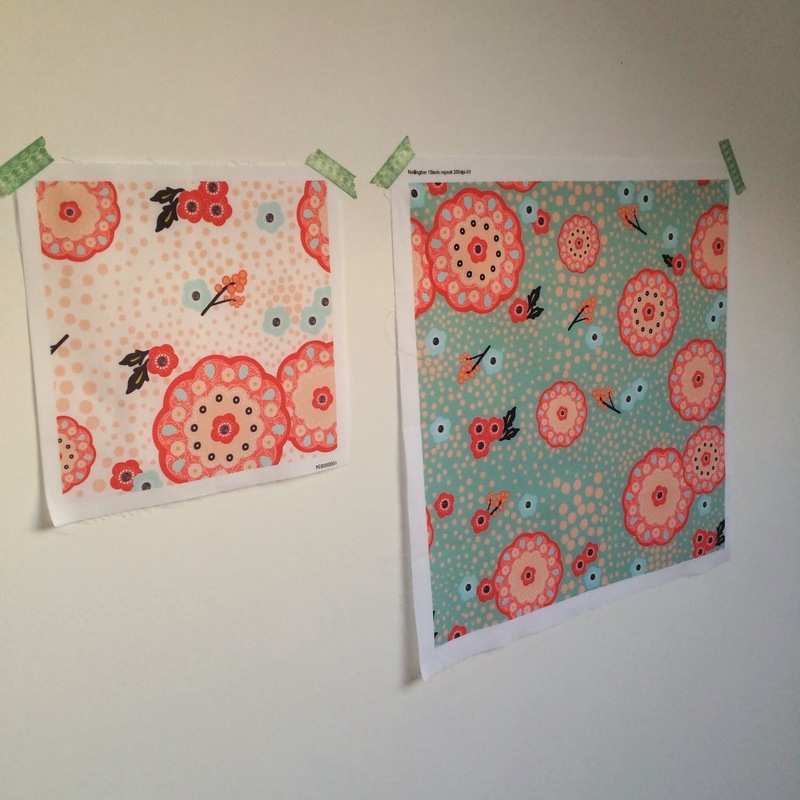 The patterns are graded to fit 2-6 year olds. Right. I'm now going to return to the job of nursing my hangover, which is the result of an evening of giggling on the sofa with my best friend while drinking something lovely. So far an early morning walk in the rain and a large plate of scrambled eggs and spinach haven't quite returned me to my normal self. I think it may require some chocolate. Just a very quick (edited: it didn't end up being so very quick after all) post to say that the new issue of Love Patchwork and Quilting is out now. 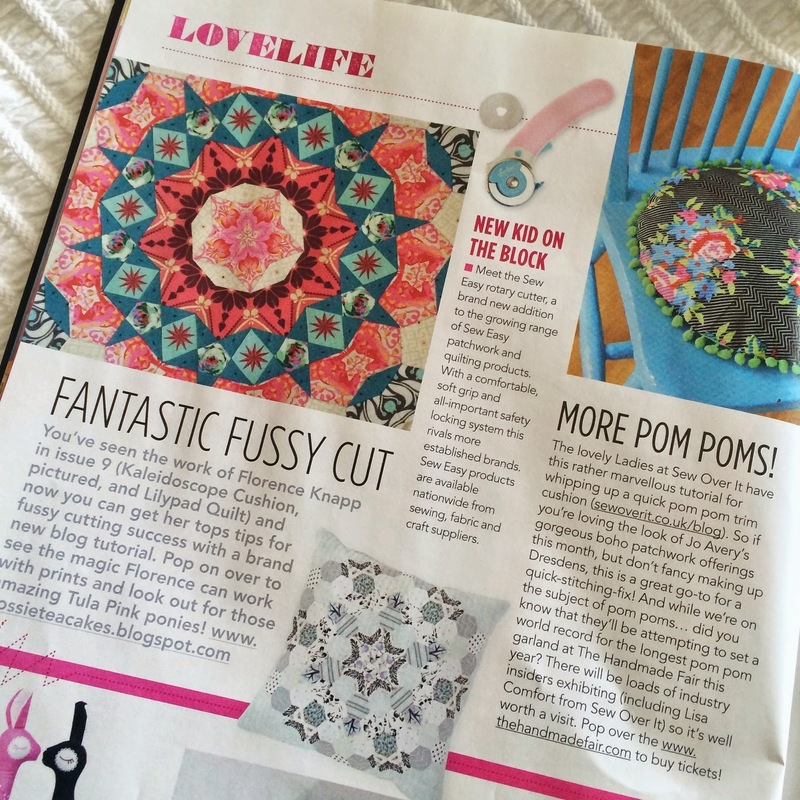 I'm so pleased to have my fussy cutting featured in their Love Life pages as these are always the pages I turn to first, so it feels incredibly lovely to have my own work in there! Admittedly, these pages are actually right near the front of the magazine, but if they were near the back, they'd still be my first port of call! I've discovered so many good things in those pages. As always it's a really good issue. 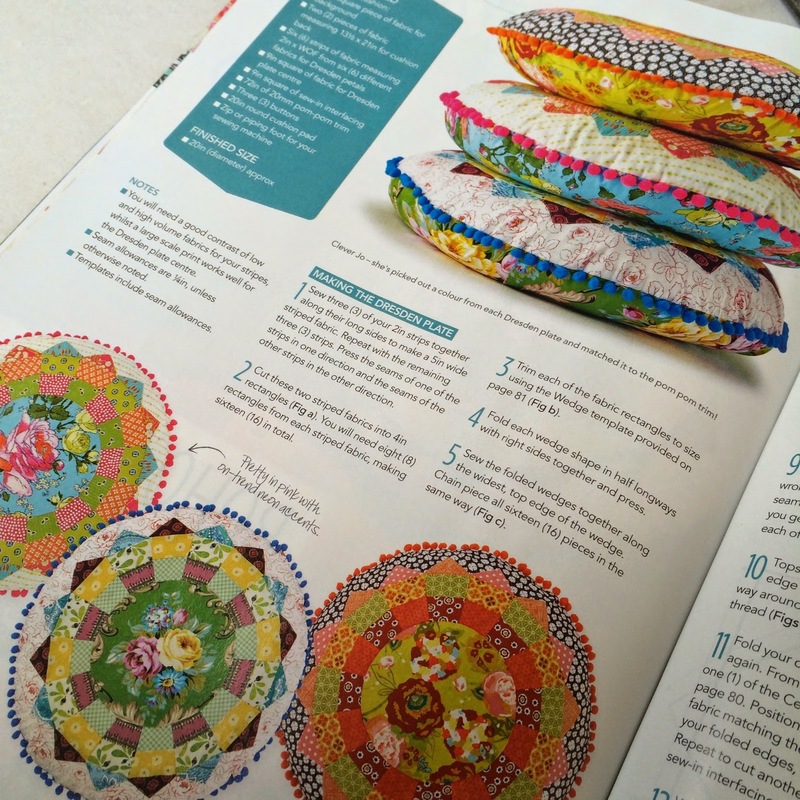 I've fallen in love with Jo Avery's cushions and I'm tempted to make some for my sewing room once it's finished, which doesn't seem so very far away! 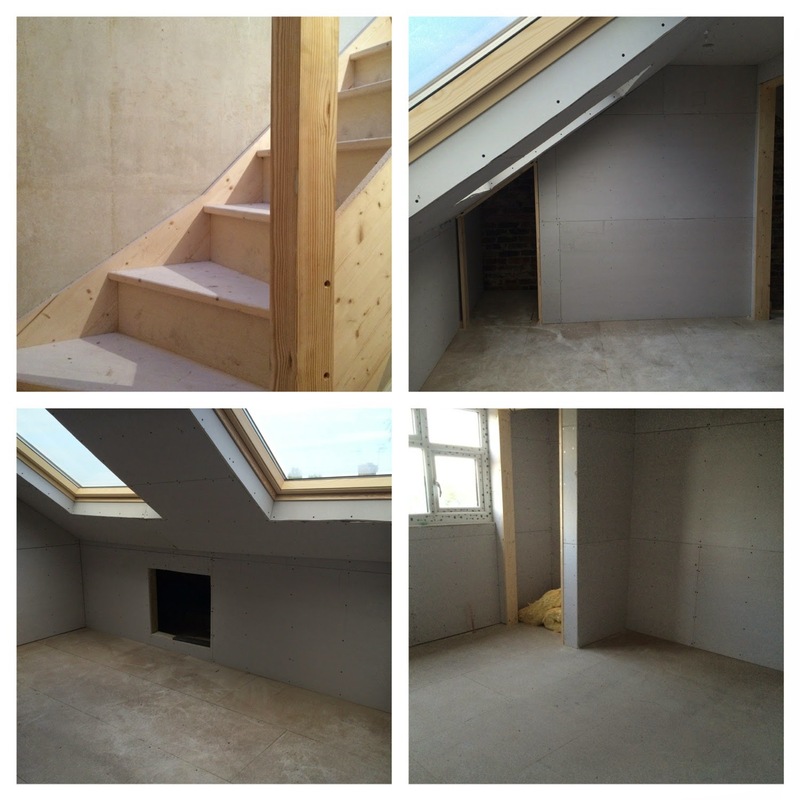 We have now have a fully waterproof roof, shiny new windows and finally, today, a staircase, which feels hugely exciting! More on that in my next post…but I can't believe quite how much has been achieved in less than three weeks! 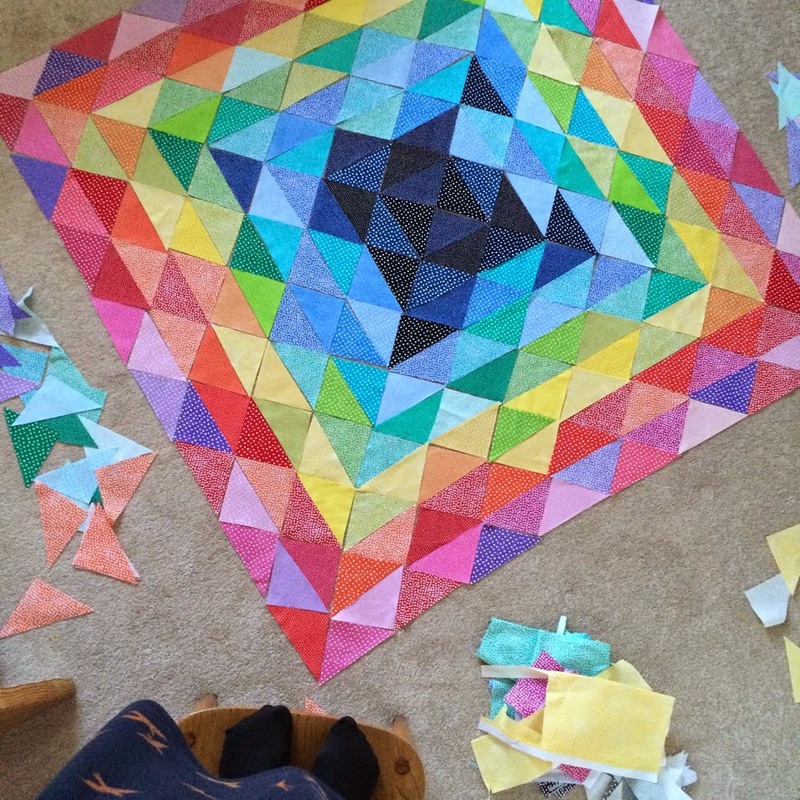 In the time it's taken our carpenters to build the shell of an entire loft and install a new central heating system, I've managed to sew just one more cogwheel for my Passacaglia Quilt (more on that next time too! )…I'm not sure what to make of that apart from: Goodness, I am SLOW! Although in fairness, we've worked so hard over the last few weeks, that by the time the evening has come, some nights I've just fallen in to bed, unable to do another thing. 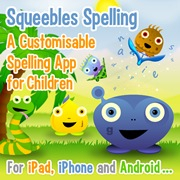 We've just released a new Squeebles app! If you have primary school aged children, you might like to read more about our latest educational app, Squeebles Maths Race, here or watch a demo video of the app here (listening to your own voice is always a traumatic experience, isn't it. I asked my daughter whether I actually sound like me. Disturbingly, she said that I do). Anyway, the fact that I sound like a boy aside, it's an app that I feel really proud of. With all of our apps we agonise over how to get it just right so that it challenges more able children, yet encourages younger or less able children. To date, we've always avoided any element of competition in our apps because, in general, learning feels like something that should be done at a child's own pace to be enjoyable. However, a lot of teachers and parents have told us that for some children competition is actually hugely motivating. So, in the background to the other apps we've been creating over the past year, we've also been discussing how to make this happen. We finally came up with what is now Squeebles Maths Race. It's a one or two player game and in two-player mode, the app allows two children of very different ability levels or ages to have a fair race against one another, because each child races to the finish line answering maths questions tailored to just the right level for them. In this way, two siblings can have a completely fair race where they both have an equal chance of winning. We've played this a lot with our own children while we were trialling the app and so I can also say it's great for parents to play against their own children too…although speedy mental arithmetic has never been my forte, so the disparity between our playing levels isn't quite as great as it could be! It's our first app that allows two children to use one device at the same time - touch screen technology is perfect for this! As always, our apps are entirely self-contained: they have no in app purchases, no public leader boards, third party advertising or links off to the app store. While we're on the subject of apps, the non-Squeebles app that features most predominantly in my own life is Apple's own podcast app. 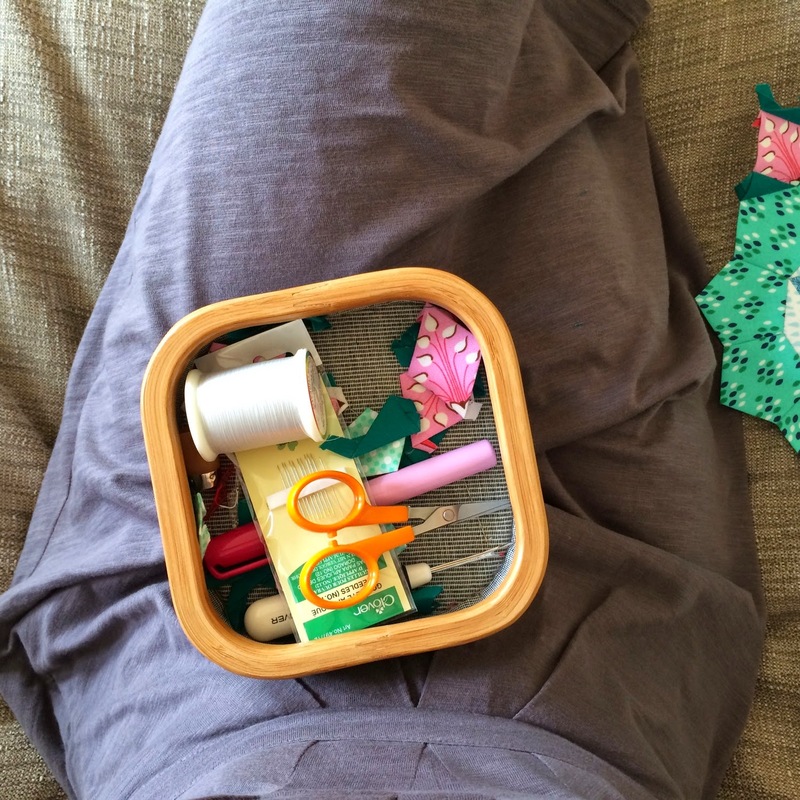 I subscribe to everything from Radio 4's Woman's Hour and Desert Island Discs podcasts to Richard & Judy's Book Club discussions; TED talks to Thread Cult (the latter offers wonderful podcasts about sewing and textiles). It's revolutionised those days when I seem to spend all afternoon walking to and from different places to drop the children off or when I repeatedly forget to buy things from the supermarket - I now relish the idea of a walk alone. They're also great to sew to though as they're completely engaging, yet don't require you to watch anything. I love that I can now listen to all my favourite programmes at a time that's convenient to me. Do you listen to podcasts? Do you have any on your list that you'd recommend?